Communication systems only work as long as there isn’t too much lying. Bright red means “angry” only as long as most individuals that are bright red are really angry. In animal communication we call lying individuals “cheaters” because they are cheating the system, using other individuals’ faith in the meaning of their signals to gain an advantage. Too many liars, too much cheating, and the communication system breaks down. However, a little bit of cheating can be sustained. This paper by Brown et al. (2012) showed that male mourning cuttlefish seem to have figured out how to strike this tricky balance of lying rarely enough to not break the system. Mourning cuttlefish males compete for females, and since there are more males than females, the competition is tough. Males frequently interrupt each other while courting, which makes it hard to mate. If the males could, they would whisper their courtship to the females so no other males would hear and notice—but they’re cuttlefish: they communicate visually, meaning they flash their courtship on their bodies for anyone to see. So how can they avoid being “overheard”? Most of the time they can’t. But sometimes, they can. If a male has a female on one side and another male on exactly the opposite side, then he can court the female on the side facing her while maintaining a “la-de-da, nothing happening here” pattern on the side towards the other male. (Paper authors’ video of this here.) The female gets courted and the rival male doesn’t interrupt because he doesn’t know anything is happening. This works really well: it resulted in mating about 40% of the time. 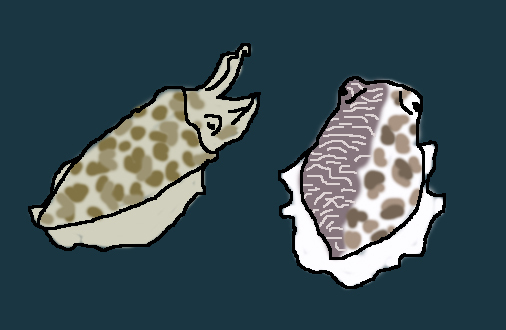 Female cuttlefish, on the left, being courted by the stripes on the left side of the male. The male’s other side faces a rival male (off to the right, out of frame) and displays a mottled non-attention-getting pattern. After Brown et al. 2012. But if the males did this too much, then everyone would stop trusting their signals, and all communication would break down. If it’s such a successful tactic, why hasn’t it broken cuttlefish communication? As in many communication systems, honesty is enforced through punishment: if a male notices one of these lying males, he promptly fights him. So males only do this lying trick when it is most likely to work; that is, only when they are exactly between a female and a male, and there are no other males around to notice and call foul. This is rare enough that the cheating, though effective, doesn’t happen very often, and the communication system endures. The moral of the story is: don’t trust a cuttlefish unless you can see both its sides. Who knows what this guy’s other side is saying? Brown C, Garwood MP, Williamson JE. 2012. It pays to cheat: tactical deception in a cephalopod social signalling system. Biology Letters 8:729-732. 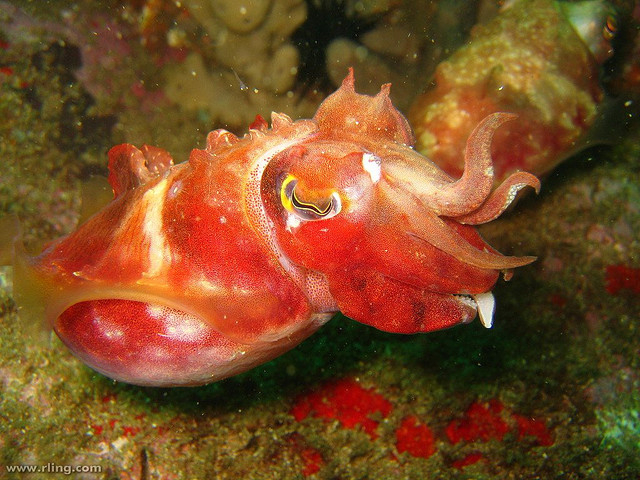 This entry was posted in featured paper, invertebrates, other people's research, video and tagged biology, cephalopod, communication, cuttlefish, featured paper, science by toughlittlebirds. Bookmark the permalink. 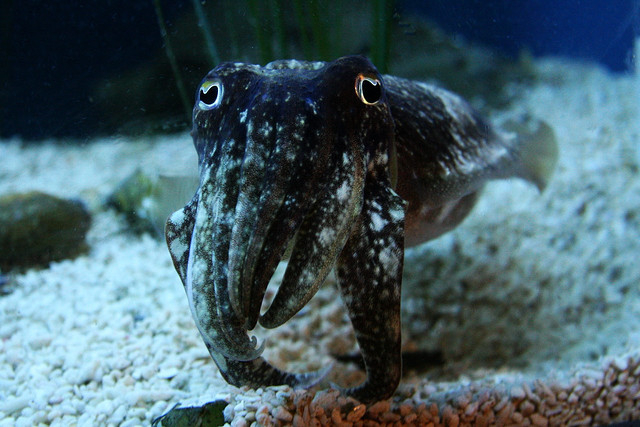 I think cuttlefish are so amazing – just love them. But, sometimes I get an instant creepy feeling from things that can do camo. Like, when I see a stick or leaf, then notice it’s really a bug…my first reaction feels like I’ve just heard nails on a chalkboard. I think it must be some primal warning instinct. There are things out there that are not what they pretend to be… it pays to look closely. Interesting information, the photos were great. Thank you for sharing. I was hoping there was going to be a moral to the story. Interesting post.